Once upon a time, a long time ago, when I was 26, and a new photographer working at my first newspaper job back in Kansas, my work presented me with a story that I didn’t know how to tell. This was my first full time newspaper. I had worked on my college newspaper when I was student. And I had freelanced for the local daily. But the Salina Journal was my first newspaper where I felt the pressure of filling the every day needs of a newspaper. Every newspaper has X amount of space to fill. The pages get filled with news, photos, ads, graphics, stats, and anything else the editors think the readers will be interested in. This daily need is referred to as the “news hole.” The space specifically allocated for local, state, national, and world events. Except, you don’t need to look at your local newspaper to hear about the latest round of Occupy Wherever. That’s what CNN is for. Local newspapers are relevant because of their connection to the regions they cover. As photographers we are told to be the eyes of our communities. That word community, it drives journalism more than people outside the industry might think, but that is an argument for later. So, I’m at this job. A daily paper. I think of this as my first real newspaper. I work for an excellent photo editor. Tom Dorsey was a great boss for a fledgeling photographer. He was committed to a strong visual presence in the newspaper, excellence from himself and the photo staff, as well as teaching, training and mentoring. Tom was one of those photographers who would tell you anything. He had no secrets to his shots that he guarded close to his heart. You want to know how he did something, what he was thinking on a particular shot — ask him. Tom believes in teaching. A story came in about a girl who had lost her leg in a lawn mower accident when she was just a baby. We were doing a longer piece on her and it was a perfect “project” for a photographer to spend some time on and really visually tell the story. By this point in my career I had some experience with this kind of project, but not much. And I was young. I was not nearly as confident in who I was as a person, or a as a photographer. That uncertainty drove me toward the safer subjects. Human suffering is never a safe subject. I have forgotten how much time I had to do this project, but the short version of this tale is that I failed. I was so uncertain of how to tell a painful story. I was uncertain of how to read my subject and find her boundaries, find out what she would allow and what was a bridge too far. And I was uncertain of my own ability. And all this uncertainty equals a lack of trust. One of the most difficult challenges in photography is to go into a situation blind, meet someone new, exhibit kindness and compassion, and then earn their trust. Promise them in actions that you will not embarrass them or hurt them. Promise them with your smile and your eyes that you are going to do everything in your power to tell their story faithfully and to not add pain to their lives. And if you don’t trust yourself, they are not going to trust you. So there was this girl. She was a young teenager and we were doing a story on her life because she was an amputee who played softball. I put the assignment off for as long as could. Rather than spending more time with her, getting to know her, earning her trust, I avoided a painful situation that I really didn’t know how to handle. I guess you could best describe my behavior as punching the snooze button. “I promise I’ll get up, just give me 20 more minutes.” Buthe deadline approaches. There’s a whole to be filled. And my staying away isn’t doing anything good toward filling that space. So, not only did I have the challenge of a difficult story, I had the added pressure of publication date hanging over my head. That is a great environment to be calm, clear, creative and compassionate in. Yeah, right. The practical results: I got the assignment done, but it was lack-luster at best. I knew it. And I knew Tom knew it. I could see the disappointment. He’d presented me with an opportunity to really grow as a photographer and instead I had shrunk away from the work. It’s only one day. One day’s paper. But the weight of that failure stayed with me a long time. In some ways, it was good. I became determined to do better next time. To not repeat my mistakes. But for all that forward looking, forward-thinking, I still couldn’t go back and undo or redo the story on the girl. The deadline had come and gone and I missed my chance. If I am remembering this right, this was 2003. Now we flash forward eight years. I’ve been in this business full time now for what feels like a very long time. And I’ve grown up. Not just as a woman, but as a photographer. I am more mature, more confident, more sure of myself and the value of what I have to offer as a visual storyteller. But fear is funny thing. It lingers. So much longer than I realized. And once you fail, then you have not only the original challenge to deal with, you have the added fear of a repeated failure. I was amazed this week to realize that I have carried a fear of failure for eight long years. Ian has the most amazing outlook on life. But I didn’t know that when I first saw the assignment. All I saw was a person who had lost their leg and a photo story was being done. In my mind, as I read the assignment, I immediately thought Patrick should take this one. But then I questioned myself as to why. I realized I was avoiding this story because it reminded me so much of my failure on that story back in Kansas. I was afraid that I would fail again. I hate being controlled by my fears. I am terrified of heights, but I will still climb, sometimes up onto a precarious perch when the photo demands it. I’m also afraid of spiders and snakes and sharks. I’ve held both snakes and spiders (yes, I once held a tarantula in one hand and held my camera in the other so I could document my moment of insanity when I put a large furry deadly, long legged, eight legged, monster on my arm). I haven’t lived anywhere that I’ve needed to confront my fear of sharks, but I know that if there was photo I really wanted that somehow required me to deal with sharks, I’d find a way to get through it. As soon as I recognized my fear as the driving force behind my decision I changed my mind about who should do these photos. It’s a good story and I’m a good photographer. I knew that I could do this, and it was time to prove that to myself. So I called him up and set the time for the first photo shoot. And now I am incredibly glad that I did. One, because I had a great time meeting this person. Too many times I’ve crossed paths with people who have been destroyed by what has happened to them. They’ve faced death or loss, some great tragedy and they simply could not find it within themselves to go on. They become victims, someone to whom something happened, and it always breaks my heart to meet such people. But it’s the survivors who inspire me. They take what life presents them, they face unimaginable loss and they build a life after their tragedy that makes your heart soar just to hear it. Ian is a survivor. It would be easy to assume that losing a leg in such a way, at such an age, would be a life crushing tragedy. Only in this case it wasn’t. As I’m photographing Ian he talked openly about his belief that this was God’s way of pointing him toward his purpose. 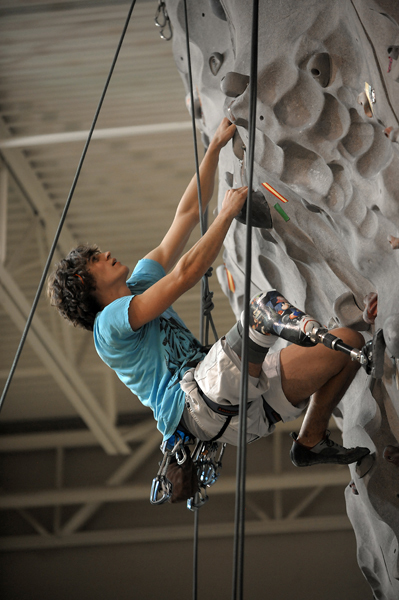 You see, Ian is just a rock climbing amputee. 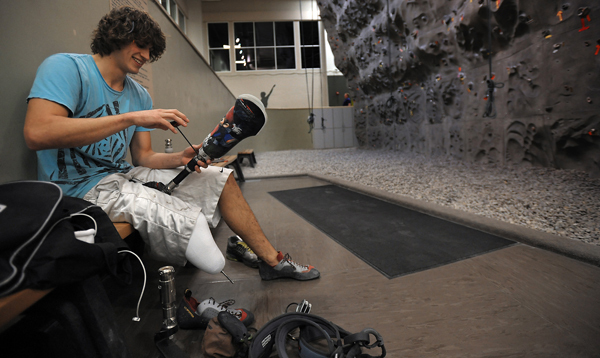 Ian now makes prosthetic legs for others. And he uses his own personal experience to make his work the best that he can. At one point I photographed him while he was using a heat gun to warm the inner liner of a prosthetic leg. He would warm the plastic and then carefully bend it slightly down and out making for a more comfortable fit when attached to someone’s leg. Why does he do this? Because he knows it makes the prosthetic more comfortable to wear. It’s something no one ever did for him. 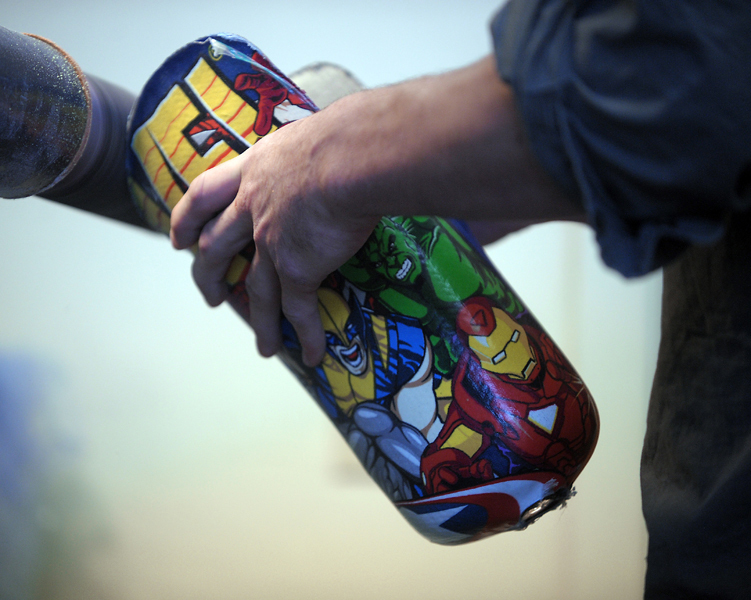 Ian is passionate about helping people who’ve lost a limb to live full lives. And he’s joyful. Even when he’s serious he’s smiling. That’s one reason I’m glad I took this assignment. The other reason I count myself fortunate is that in doing these photographs I feel I have redeemed a failure from my past that I didn’t even realize I was still haunted by. A few weeks ago I was writing about the things I’ve gained and lost in my life as professional photographer. Now I can add this to the list, I’ve gained confidence. In the years that I have been working as a photographer I have gained the ability to walk up to a complete stranger and ask if I may take their picture. I gained an awareness of my own worth as a photographer, I trust that, and I now have the ability to win the trust of those I photograph. No, not every person ends up trusting me, but most of them do. At least they trust me enough to let me tell their story and I am honored by this. This is the kind of story I wish I could have spent weeks on rather than hours. I got the assignment Wednesday morning and the deadline is Thursday afternoon. I got the deadline pushed back to Friday morning so that we had time for two photo shoots, one at the office and one of Ian on the climbing wall at my gym. I feel like I only got the scratch the surface with these photos, and yet they are enough to make me feel free. I can’t undo my mistake from my days at the Journal. But I can let it go. I’m a better photographer now. I’m also a better person. And I can tell this story. I don’t have to run from it. And won’t ever run from it again. your personal work is as laudable as your photography work. i share your approach to fear – bring it to your side!i must admit that one thing i really like about this blog entry is seeing the photos of Ian in color and sharp clarity…wow, an adorable human being, yes? Yes, adorable is good word, although I doubt a 24 year old guy wants to be labeled that way. He was a great person to meet. One of those that forces me to re-evaluate my life in terms of what challenges have I really faced, and what I have let pass me by out of fear. I am so glad I got to do this story.